Enjoy additional savings of up to 5% on all kinds of radiators including traditional, designer, stainless steel, cast iron, column and aluminium pieces. No need to hold up your DIY project while you wait for deliveries. Many items including heated towel rails and designer radiators can be delivered by the next working day and, what's more, it won't cost you a penny! Where do I use my Trade Radiators voucher code? Find a code you would like to use on NetVoucherCodes and copy it before following the link to traderadiators.com. Add your radiators to your basket, then when finished, view your basket. Just under your order summary, you'll see a 'Coupons' section, just put your code in here to get a discount applied to your order total. Click 'Checkout Now' to continue and complete your order. "if you wait on the homepage for a few minutes you'll get a 5% discount off your first order." Trade Radiators is one of the leading suppliers of Radiators in the UK. As a company, they've been supplying a wide range of convector, designer and column radiators at trade prices for over ten years. During this time they've quickly become the largest independent retailer of their type anywhere in the UK. Trade Radiators also offer a range of accessories as well as radiator valves, with all products available with free delivery to the UK mainland and most delivered the next day, within 24 hours. Trade Radiators do not rely on expensive showrooms, instead, they deal with brands and manufacturers directly, showcasing all their products online, allowing them to pass significant savings onto customers easily and quickly. This guarantees top quality products at low prices. Trade Radiators offer a number of discounted radiators in all sections of their website. You can get high percentages off radiators in sales throughout their site. On the homepage, you’ll find current sale items and offers from brands such as DeLonghi as well as big savings on radiator categories like column radiators, convector radiators, designer radiators, aluminum and cast iron radiators as well as heated towel rails. Trade Radiators offer a huge range of Designer Radiators, from stylish vertical pieces, main feature radiators, slimline tall products to fit small alcoves, large striking brushed satin stainless steel radiators or lightweight aluminum pieces. They have it all. In the designer radiator section, you’ll find great products like the skyline radiator, the Monza or the Staten piece. All the designer radiators featured come in a wide range of sizes, finishes and designs, all with free delivery and comprehensive guarantees. Trade Radiators are proud to offer the best quality, and value heated towel rails, designer, convector, column and cast iron radiators as well as radiator valves available to customers on the web. You’re guaranteed low priced Trade Radiators with their price guarantee - if you find the same specified product being offered for less they promise to beat the price. This guarantee applies to UK residents only and to any UK based online retailer's total price, including postage and packaging. The advertised price must be their standard value for that product and is only valid at the time of the purchase. Do you only supply to the Trade sector? No anybody is able to order online and take advanatge of the fantastic prices. All guarantees are clearly stated on the product details page and are usually governed by the material of the product. They will generally be for between 10 and 25 years depending on the type of radiator and proof of purchase will be all that is required should you need to make a claim. Should you need to get in touch, you can either email, call or write. call - 0141 225 0430 lines are open 8:30am to 5:30pm Monday - Friday. Write to - Trade Radiators Ltd, 82 Mitchell Street, Glasgow, G1 3NA. 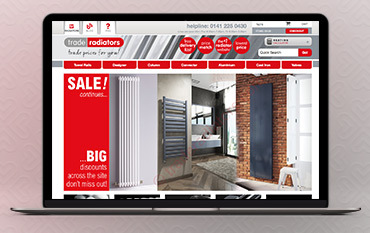 Trade Radiators have been trading online since 2004 and, over the last decade, they've increased in size and scope to become one of the largest independent retailers of their type in the UK. All the heating products available on their site are manufactured to the highest possible standards and are rigorously tested before being made commercially open to the public. And, because all their trading is done directly they are able to keep costs low on such high-quality products, consistently bringing customers great deals on their whole range of desirable and stylish products. Use a Trade Radiators coupon code to get even better value on all this and more. So, whether you’re looking for something cool and contemporary, or something classy and traditional, you can find a stunning variety of radiators and towel rails that suit all preferences, while simultaneously maintaining the highest quality and the lowest price possible.